Benjamin Netanyahu has accused ‘Western governments, and mostly Scandinavian’ of trying to remove him from power by spending millions of dollars on meddling with Israeli upcoming elections where Israel's prime minister is facing a tough challenge. "Scandinavian governments have spent millions of dollars on a campaign to remove me from power," he said in an interview on the Kol Israel radio station. "Western governments, but mostly Scandinavian...They know perfectly well why they prefer Buji and Livni [his opponents in the elections] to me," Israeli PM added, as cited by The Local. Buji or Isaac Herzog is a chairman of the Labor Party and Leader of the Opposition in the Israeli parliament who criticized Netanyahu for failing to present a proposal for peace with Palestinians, while Tzipi Livni, former Foreign Minister, is a leader of Hatnuah liberal party. Herzog and Livni once said Netanyahu is endangering Israel’s ties with the US for the sake of his ambition to keep his office. Netanyahu’s own Likud Party is facing a tough run against competitors in the elections that take place March 17, where the vote will decide the next prime minister. The Israeli PM repeated his accusations, addressing "Scandinavian governments" in an interview with Rega Radio station. “Foreign governments, specifically Scandinavians, are part of a worldwide campaign to topple me," he said, according to translation posted on Twitter by Israeli blogger and journalist Tal Schneider. Netanyahu’s ‘they-want-to-topple-me’ comments were far from being welcomed among social media users in Israel. Gershom Gorenberg, Israeli historian, journalist and blogger, called the statements by the Israeli PM merely a “last refuge of the fading strongman” who accuses “outside agitators and foreign governments”. The relations between Israel and ‘Scandinavia’ have recently been challenged. In October Sweden became the first EU country to recognize Palestine as a state. "We are not picking sides. We're choosing the side of the peace process… There is a territory, there is a population and there is a government", said the country's new Foreign Minister Margot Wallström. Following Sweden’s decision Israel ambassador to Sweden Isaac Bachman was recalled to Tel Aviv. In January Wallström canceled her trip to Israel, claiming that no Israeli official was willing to meet her. “The Swedish foreign minister would not have received any official meetings in Israel if she’d travelled here…It is no secret that Israel sees Sweden's recognition of the state of Palestine as an extremely unfriendly act,” Israeli foreign ministry spokesperson Emmanuel Nachshon said. This is not the first statement by Israeli PM on the conspiracy to topple him. Earlier in march he said he believes there is a “huge, worldwide effort” to make sure he does not get reelected in the upcoming elections. 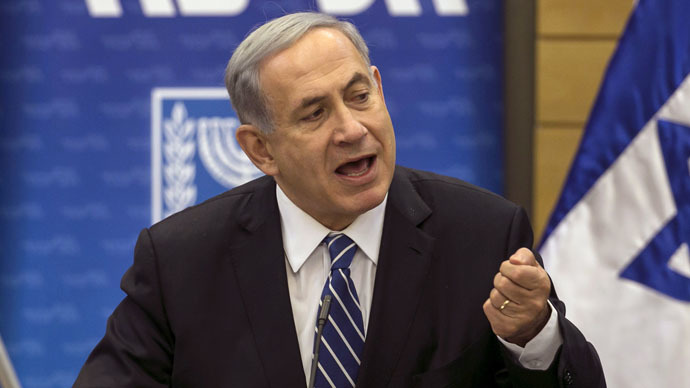 "It is a very tight race,” Netanyahu said in the interview to Army Radio. “Nothing is guaranteed because there is a huge, worldwide effort to topple the Likud government."